Heroes, Heroines, and History: The Garden Tomb with #giveaway! The Garden Tomb with #giveaway! With the new movie Risen coming out, and Easter drawing near, I thought I would take ya'll on a trip with me to visit the Garden Tomb in Israel. Out of all the sites that we visited during our trip to the Holy Land, this one tops them all. There are actually two places near Jerusalem that claim to be the place that Jesus was buried. There is the Catholic Church of the Holy Sepulcher, and then there is the Garden Tomb which was claimed by Protestants, which is where our tour took us. I found the facts about the Garden Tomb to be very interesting, and thought you might too. The Garden Tomb is a beautiful place that simply takes your breath away. As you enter, you are met by plants, flowers and stone landscaping that transports you to the Biblical era. 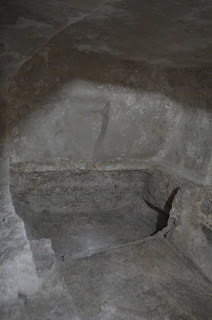 The site is very unique, and after hearing the guide's explanation, I too was led to believe that this might very well be the sepulchre of Joseph of Arimathea, which Jesus borrowed. The garden was first discovered by a General Gordan in the late 1800's. 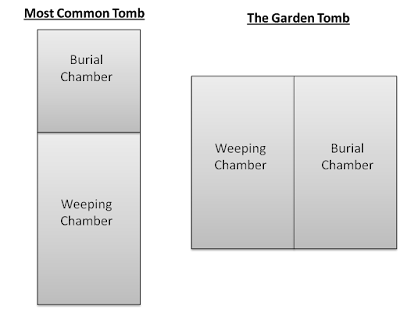 He began to question whether the Church of the Holy Sepulchre was the true location of Jesus' tomb, because that site lay within the city walls, and the Scriptures describe the tomb as having been outside the walls. The hill next to the Garden Tomb site is believed to be the most northern point of Mount Moriah. It was first a rock quarry, but afterwards became a place of execution, specifically for stoning. It would have been near here that Stephen would have been martyred. 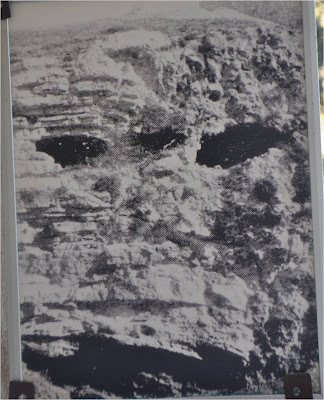 For this reason, it is considered that this may be the hill Golgotha. The word, Golgotha means "place of the skull". This hill looked very much like a skull, until they built at the foot of the hill around the 1960's. 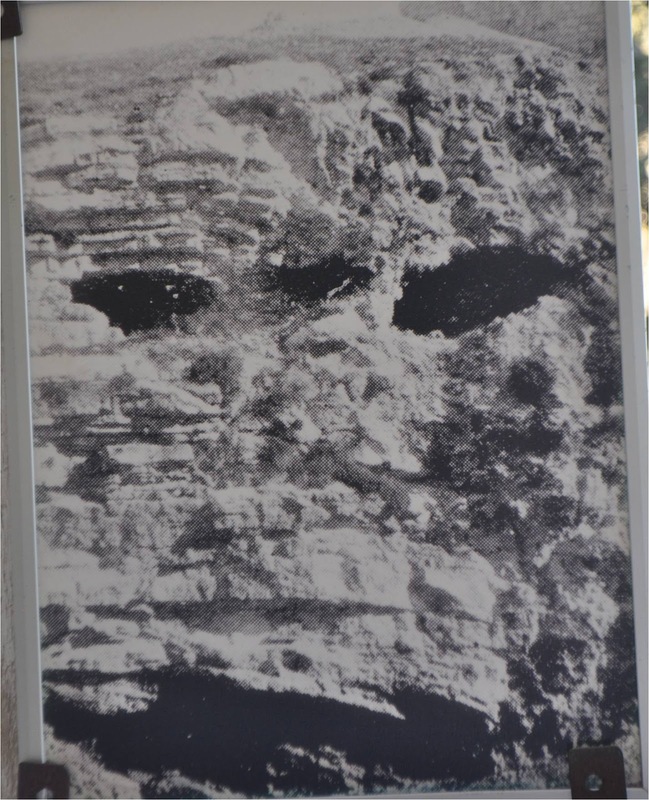 Golgatha Hill - Can you see the skull? According to the gospel of Luke, the tomb was in a garden that was near to the place of crucifixion. This is another reason that the Garden Tomb is a plausible candidate for the site of Christ's burial. The tomb is quite close to the Golgatha hill, and was a garden or vineyard around the time of Jesus. The size of the cistern found on the site also indicates that the owner of the garden had to have been a wealthy man, as Joseph of Arimathea was. There are three unique things about the Garden Tomb, that are spoken of in the Scriptures. Second, this tomb was hewn out of stone, (also Matt,. 27:60) rather than a natural cave as many in the area were. But probably the most astounding element for me, was the third unique thing about this tomb. The gospel of Mark makes some detailed observations. 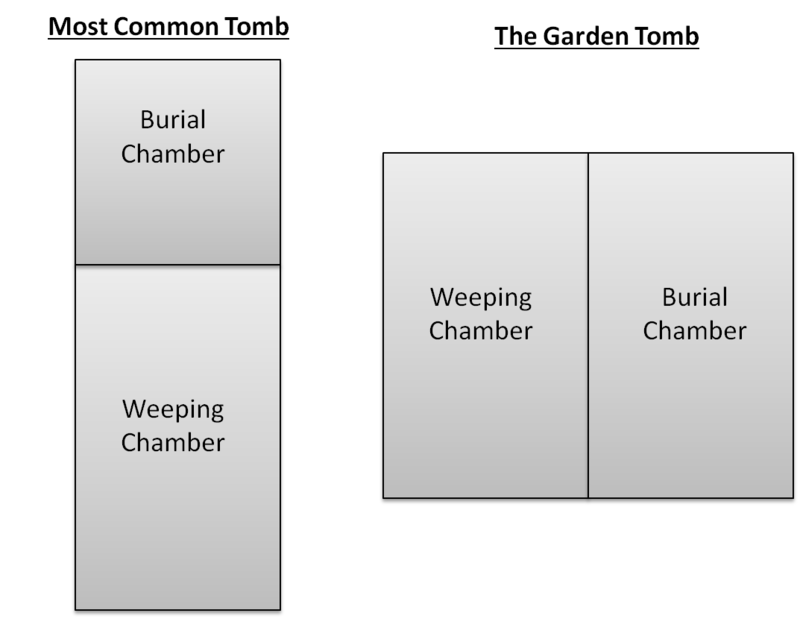 It is interesting that he notes "Sitting on the right side," because the majority of Jewish tombs in those days had the burial chamber straight ahead, but the Garden Tomb has its burial chamber to the right of the weeping chamber. So is this really the place where Christ was buried and resurrected? I don't know. No one does. But that's not what is important. What is important, is that HE IS NO LONGER THERE. He is risen, as He said. 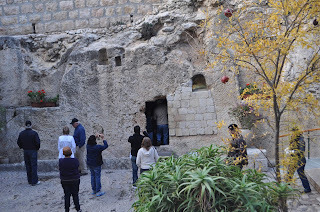 In my book The Master's Calling, Malon visits the Garden Tomb during the short period that Christ's body is still there. In celebration of Easter, I'm offering an ebook giveaway so that you can experience it along with Malon! Wishing each of you a very joyous Resurrection day! If you'd like to learn more about the Garden Tomb, you can view a video of the tour and read all about the site at www.gardentomb.com. Amber, thank you for this explanation and description of the Garden tomb. I've never been to the Holy Lands, so I appreciate your perspective of the place our Savior was temporarily laid. So glad you enjoyed the post! Our tour to the Holy Land was life changing. The Bible truly becomes a whole new book to you. Thanks for sharing this, Amber. 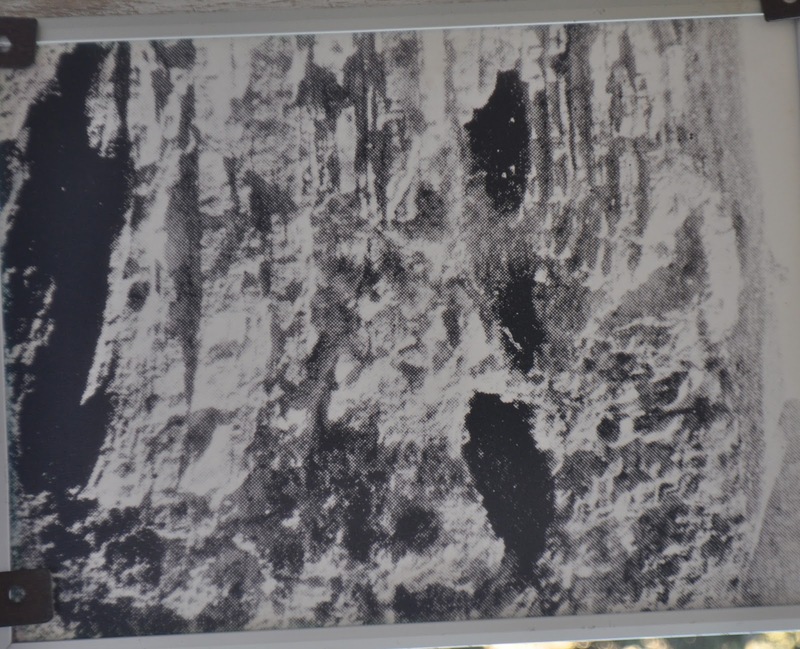 I got the privilege to visit the Garden tomb when we lived in Israel, many years ago. You have to admit there's something very special about the place. And it's quite amazing that it's still there after so many hundreds of years. PTL! I agree with you, Vickie. There is something special about the place. :) It was my favorite stop during our tour. We had the honor of having communion while we were there too. An experience like no other. A wonderful post - thank you, Amber!! I've always wanted to tour the Holy Land - can't imagine literally walking in Jesus' footsteps!! So glad you enjoyed it! If you ever get the chance...go. Visiting Israel is something I recommend to add to everyone's bucket list. It's a life changer. Thanks for stopping by and entering the giveaway. Congratulations, Bonton! You're the winner of the book! Please email me with your contact information and I will get your prize out to you. visionwriter2 at gmail dot com. Fascinating article, Amber! There's certainly a compelling case to be made that this is Jesus actual tomb, but as you say, the most important thing is that his body isn't there! What an appropriate message for the coming Easter season! Thank you, Joan! Absolutely, the most important thing is that JESUS IS RISEN! Very interesting. I always love to here your inputs. You are terrific. God Bless. Aww, Debra, you're so sweet. Thanks for stopping by. So glad you enjoyed it. I wold love to win your book. It sounds very interesting and good. I will send you my address upon request. Thanks for the giveaway chance. Thank you for stopping by! I've got your name in the drawing. Very interesting. Thanks for the giveaway. Thanks for stopping by, Betti! Best wishes in the giveaway. 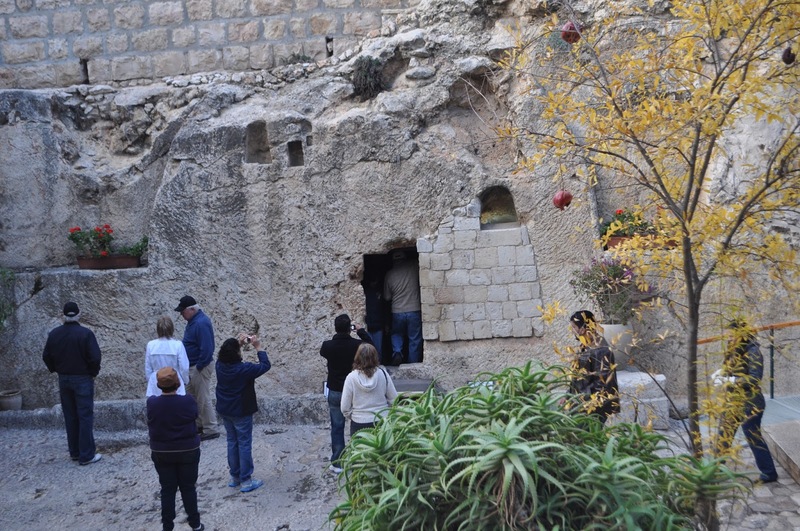 Very interesting article on the Garden tomb. Thank you for the giveaway and God Bless You!!! Hello Sandra! Good to see you stopping by. :) Best wishes in the giveaway.